One-Day, Two-Day & Three-Day Courses; Based In The Wilds Of Kerry & West Cork. Beginners Welcome! Killarney National Park - Top Place To Be! 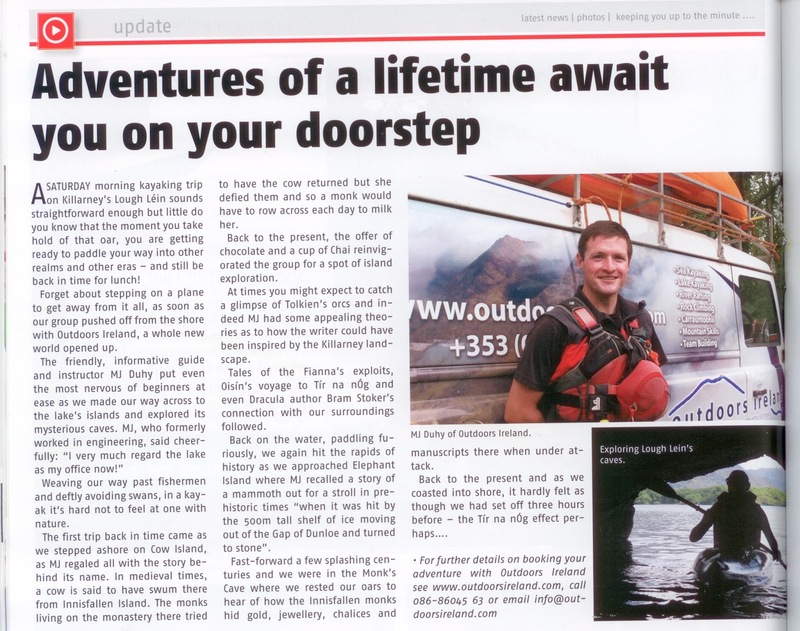 Thanks a million to Killarney Advertiser and Eve Kelliher for joining MJ recently for a kayak tour through the Lakes of Killarney. Sheep fleece makes a great blister patch or can be used to stuff into your jacket for warmth, especially in the neck/cuff/zip areas. Sheep bone makes a great peg, stake or digging tool. If using as a digging tool it really needs to be sharpened. I have looked at Emergency Bivvy On The Mountain already. Now it is time to look at a similar emergency on the water; in a kayak, canoe or sit on top. Potentially more serious than a mountain as you are dealing with possibly being immersed in the water and being completely wet. Also we tend to carry less safety gear on the water than we do on the mountain. 1. Avoid getting into this situation in the first place. Be super safe, be super careful, be super planned. Carry the right gear, including mobile phone or radio. Leave a route card and really know the weather. When you look at the weather, look ahead to the next day also, as weather systems can travel in earlier than expected. Two good websites I use are www.met.ie and www.windguru.com. 2. Level 2 Skills is a min level to be at, and Level 3 Skills is a really solid/safe level to be at. 3. In an emergency there is no such thing as overkill in terms of the preparation you have done; or the gear you are carrying. 4. On lake and sea - wind is the major danger. On river - rainfall/high water level is the major danger. Water - Keep Your Body Working Well By Staying Hydrated. Please Remember What's First - Handy Acronym For Above! 6. Order Of Priority keeps repeating, for example if you are calling for rescue it it one job to get safe for the short term while you make your rescue call; it is another job to get safe for the long term, while you wait for rescue to arrive. 7. Make a super human effort if needed and make for land/river bank. If you can reach land/river bank things become easier and safer. However don't put yourself at more risk by trying to self rescue. 8. Otherwise raft together securely as quickly as possible if things begin to spin out of control. Ideally raft all facing the same direction, securely held together and paddles locked under your elbows. This is a good skill to practice. Being rafted gives you a working platform, allows a rescue call, allows basic first aid and keeps you out of the water. It is also a more visible target for rescuers. 9. Don't become complacent in your raft. If a boat capsises or someone swims it will be extremely difficult to deal with; however in your raft it may be possible for someone to reach into their hull/hatch/dry bag for equipment. 10. When making a rescue call, let one of the middle members of the raft call; meaning there is slightly less wind noise. 11. If you have a swimmer who is too exhausted to get back into their boat by normal x-rescue, you can make your raft against the swimmer and they can crawl onto the front deck of the raft, inch by inch. 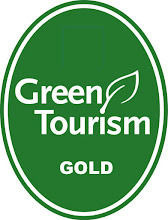 As part of our Outdoors Ireland Training School anyone who has completed a training course with us is welcome to come back and repeat that same course in the future, free of charge! 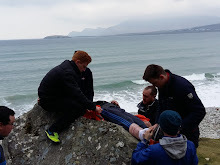 So if anyone would like to repeat a Mountain Skills 1, a Mountain Skills 2, or a Rock Climb 1, in the next few days do get in touch - info@outdoorsireland.com.